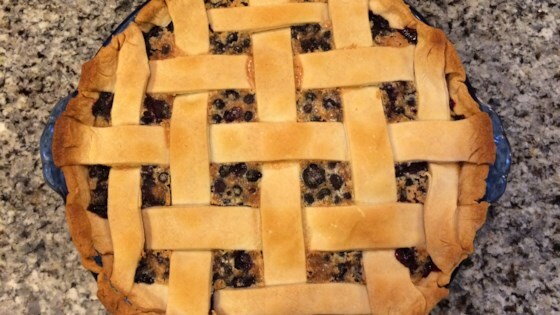 "Blueberry custard pie, a delicious summer treat." Preheat the oven to 410 degrees F (210 degrees C). Line a pie plate with 1 pie crust. Beat eggs slightly in a large bowl. Mix in sugar, flour, cornstarch, milk, nutmeg, cinnamon, and salt. Add blueberries; stir to combine. Pour blueberry mixture over the bottom crust. Roll the top crust into a 10-inch circle. Cut into 1/2-inch strips with a sharp paring knife or pastry wheel. Moisten the rim of the pie with a small amount of water. Start with the longest strips and lay the first 2 in an X in the center of the pie. Alternate horizontal and vertical strips, weaving them in an over-and-under pattern. Use the shortest strips for the edges of the lattice. Fold the ends of the lattice strips under the edge of the bottom crust and flute the crust. Bake in the preheated oven until center is set, about 50 minutes.